It can be said that a product emblazoned with the mark ‘Made in Germany’ is held in high regard as an object of quality and craftsmanship. The label carries a connotation of refined evolution and superior engineering, evoking thoughts of scientists, fast cars and respected brands such as Porsche, Siemens and Adidas. Lufthansa, Germany’s flagship carrier, provides a perfect example of the calculated precision that trademarks a ‘Made in Germany’ enterprise. The airline is expertly organized and the most important decisions filter down from the top for systematic implementation. No business maneuver is undertaken without serious evaluation and total confidence that it will benefit the airline’s brand, its operations and, of course, its passengers. 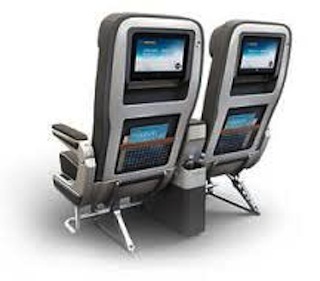 Lufthansa’s late announcement of a premium economy offering, several years after implementation by some rivals, could be an indication of just how careful and calculating the company is. Rather than rush out with a mediocre product or risk cannibalizing its business class, marketing teams at Lufthansa took their time planning and positioning this, their first new class development in 35 years. Aircraft Interiors International sat down with Jens Romca and Jochen Müller, the men behind the wheel at Müller|Romca, the German design firm (with offices in Hamburg and Kiel) which designed Lufthansa’s Premium Economy Class seat. 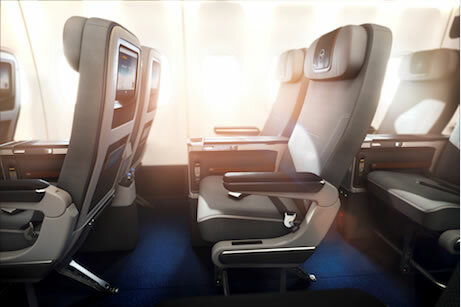 The interview unearthed some unique insights into the many aesthetic and technical decisions that went into, and continue to shape, the premium economy seat unveiled at Aircraft Interiors Expo in April 2014. The winning design concept reflects the very German ideal of streamlined precision in design. German people, in general, tend to take a ‘no frills’ approach toward luxury. Serious, professional, accurate and modest – all are words that one could easily associate with the Lufthansa brand itself. They are also words that the design duo Müller and Romca use to describe their concept, one of many tasks they have completed in the past decade for Lufthansa. 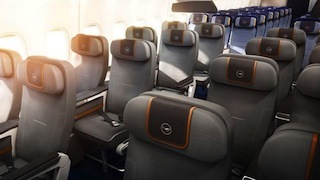 According to Müller|Romca, Lufthansa’s premium economy was originally set to continue the color story of the carrier’s economy seat, which is dominated by shades of gray and blue and accented with golden yellow. This idea was abandoned, however, as it resulted in a seat that too closely resembled economy. Many smaller elements including coat hooks, bumpers and parts of the center console are made from aluminum that has been anodized to improve durability and to create a natural and high-quality appearance (this material is also used in business class). Brown leather trim imprinted with the words ‘Premium Economy’ was sourced from German leather house Traveller Jean Weipert and used along the top of the netted seatback pocket. It also functions as a restraining mechanism for PEDs. These leather details, combined with a bottle holder at knee level, clean and technical lines and simple radius curves, lend a distinctly automotive flavor to the cabin. Every passenger has their own headset jack, USB port and 110V AC power outlet. IFE hardware will come from Panasonic Avionics or IMS/KID, depending on aircraft type. The center console is an area of precise integration, packed tightly with one, or more often two, IFE boxes near the bottom, AC power, headset jacks, tray tables, life vests, handsets for the in-seat entertainment, and a dedicated PED stowage area. “If you submerged it in water, no bubbles would come out – it’s that tight,” Romca jokes. Despite having some influence on material sourcing, Müller and Romca admit that they had no say in Lufthansa’s selection of ZIM Flugsitz as the seat manufacturer. Although the new seat is based on the BC-01 model, major design and functional changes had to be made – a challenging task for ZIM. Still, the designers report that the entire seat development took well under two years, a relatively short time for a program of this complexity. There is still a lot of fine-tuning required before the product is ready for its fall roll-out across Lufthansa’s B747-8 fleet. The ink is still drying on at least one key supplier contract and new challenges pop up daily, but Müller and Romca are confident that when the big day finally comes, their ‘Made in Germany’ design will be well-liked by a wide world of passengers who could be ‘made’ just about anywhere.